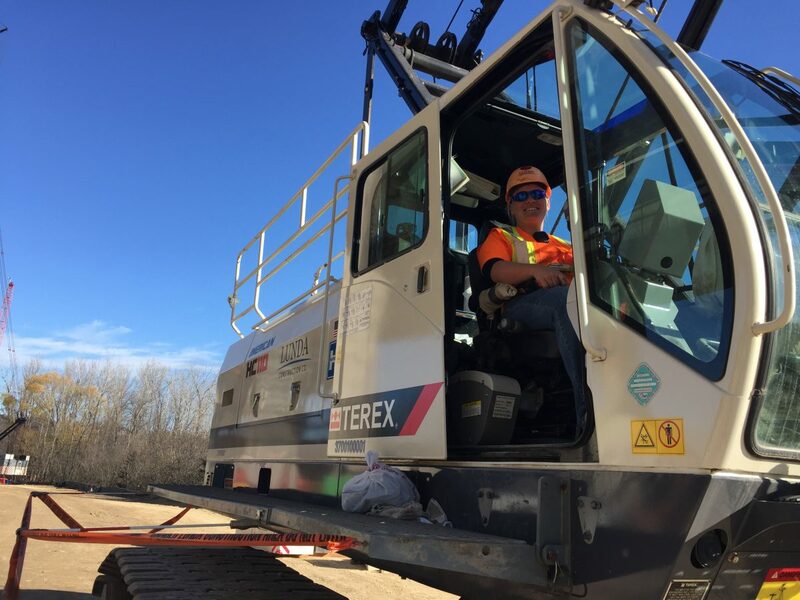 Lisa Klankowski, a five-year member of Local 49 and current apprentice at the Operating Engineers Local 49 Training Center, has worked her way up from operating small equipment doing dirt work to now operating cranes at the St. Croix River Crossing Bridge project for Lunda Construction Co. However, prior to her time as a heavy equipment operator, she said her life was much different. “I was working in a call center and I absolutely despised it,” she said. That all changed when five years ago she met Rochester business agent Clayton Johnson, and talked to him about some possible career opportunities. Klankowski said once she landed her first job, she then started going up to the Training Center and taking as many classes as she could. After being on a jobsite for a couple years, she took interest in operating cranes and decided to pursue it. “At that time I was still doing dirt work, and I didn’t start the cranes until a year or two into the dirt program,” she said. “I like having a challenge, and with a crane it’s a daily challenge,” she added. As far as being an apprentice, and being new to operating cranes, Klankowski said it can be intimidating at first. Klankowski said the training she received at the Training Center was “awesome”, and liked that the instructors can work with all skill levels. “You go up to the Training Center and all of the teachers are so knowledgeable, and they can kind of gauge you in your own skill level,” she said. “You have people (apprentices) up there that are lower in skill level, and some are up higher, but the instructors are great with adjusting to that,” she added. In addition to great training, Klankowski said the Training Center also helps apprentices find jobs. “Then, they get you out to jobs where there is so much going on, and so much opportunity for moving up in the world,” she said. Klankowski said she isn’t stopping her training as she continues through the apprenticeship program with Local 49 Training Center, and soon will be graduating from the apprenticeship program. “It’s all about paying attention, and soaking up as much information as you can,” she said.